On a recent trip with Jenn, I observed a young child waiting for his prescription. Sitting in his seat, he turned around to find a lady who was on the phone. The little boy looked so confused and a little scared to find that she was not holding a phone. She was using her bluetooth headset. This got me thinking. 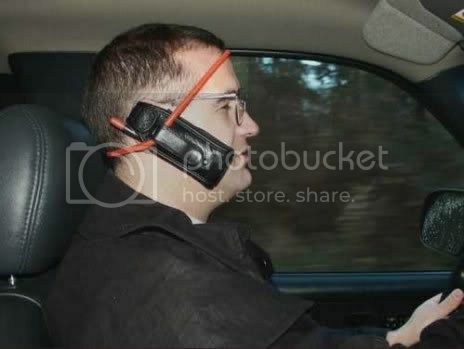 In the near future (July 1st people) CA law requires everyone to use a hands free head set while using their phones in the car. With the increase of bluetooth head sets, I wondered if children will soon see hundreds of adults "talking to themselves." Or better yet, they might think that the adult is talking to them. In someways I wonder if there's going to a increase in childhood trauma, when a toddler walks around with their parents to find so many people just chatting with the air around them. I know for a fact that if bluetooth was invented when I was a child I would have been a bit more paranoid of crazy people. A question. How does he press the answer button? I've actually been driving a few times on the 134 and seen someone wearing one.